Jamar Briscoe earned plenty of recognition and accolades for his stellar performance in his freshman season as a point guard with N.C. Central. What he didn’t have, and craved, was a chance to compete for postseason conference titles and NCAA berths. Briscoe, a 5-foot-10, 155-pound point guard from Baltimore, is transferring to the Charlotte 49ers. He will spend his first season as a walk-on paying his own way, then have three seasons of eligibility remaining during which he will be on scholarship. Briscoe is expected to arrive in the Charlotte area by the middle of next month and will enroll as a student for the fall semester in August. “I was looking for the opportunity to go to a school and compete for championships and face better competition on a regular basis,” said Briscoe, who averaged 17.8 points a game for the Eagles, second-best in Division I among freshmen. Only Charlotte native Seth Curry, who played at Liberty, scored more as a freshman last season. Curry has since transferred to Duke. Briscoe said he picked the 49ers after also considering N.C. State, Virginia Tech, Duquesne, La Salle and Niagara. “I decided I wanted to play in the Atlantic 10. I did some research and although Charlotte and a lot of the schools in the A-10 are not necessarily close to home, the league has produced a lot of good guards,” Briscoe said. At N.C. Central, Briscoe’s awards were numerous: He was named to the Black College Men’s Division I All-America Basketball Team, named the Division I Independent Newcomer of the Year, named to the CollegeInsider.com Freshman Mid-Major All-America Team and the N.C. Collegiate Sports Information Association All-State Team. Briscoe started in 30 of 31 games for N.C. Central, which completed its second season as a Division I independent. He also led the team in assists (2.6) and steals (1.8) per game. He scored 20 or more points 11 times and had five games with 30 or more. Among his highlights: 28 points, four assists and four steals in a loss to N.C. State and 34 points and three assists against Duquesne. “I have no doubt we will be competing for championships while I’m playing at Charlotte,” said Briscoe, who was recruited by 49ers associate head coach Rob Moxley. “Coach (Bobby) Lutz lets his guards play in a controlled, open system. Welcome to Charlotte Mr. Briscoe! When did Charlotte College leave the Sun Belt? Great. Another transfer to join the 49ers' roster of jucos and D-I nomads. Do they even try to sign high school seniors anymore? I am a NC Central alumni, and I assure you that UNC Charlotte is getting a true BASKETBALL player he is ten times better than Dijuan Harris, and he will be the best player on the team this coming year. 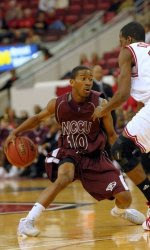 The NCCU Eagles had a much tougher schedule than UNC Charlotte! And if you don't believe me go to NCCU.edu athletics and look that up. They played the best of the best in Division 1 and though they didn't beat them, Briscoe scored in the 20's and 30's almost every night. Though I feel bad for my alma matter, with him and maybe one other piece, UNC charlotte has a chance to go back to the tourney. Mark my words!! does he not have to sit out next year ? and Phil Jones, Charles Dewhurst, Ian Andersen, and Anjuan Wilderness. All four year guys. It's just another clown that knows nothing about Charlotte that likes to hate on it. Jones and Wilderness may be 4 year guys but they fit the bill as "d-1 nomads"...and all four have really panned out for us as stars. "BRISCOE IS THE TRUTH" he dominated guards in the ACC,SEC,and A10 as a freshman.I have seen him play numerous times in the NC area and trust me this kid has the potential to be a PRO. Hey 734 am, go sniff your Curry-less Wildcats. Umm...Charlotte's schedule ranked 90th in the country. Central's was 266th. That cant be right. UNC-Charlotte doesnt compete in tournaments. He must be confused with the Tarheels.